Is he right?! Are Christians closing their eyes to the evidence and seeking an evasion from the responsibility to explain the cause of the apparent design? It seems that the only explanation that would be satisfactory is one of total chance. The question presumes that at some deeper level of scientific inspection there will cease to be an apparent design and then science can conclude that life was really caused by natural causes – time and chance. Skeptics will try to show how evidence contradicts the existence of God, while believers attempt to examine the evidence to see if it is reasonable to conclude that God exists. And he compares it to a conjuring trick, a magic trick that though you want to believe it, you must stop and remind yourself that it’s not a miracle. Dawkins, like most of the celebrity atheists, begs us to wait for the future evidence that will presumably point to a rational explanation supporting natural causes. When you listen to enough atheists you realize that the discussion isn’t about reason or evidence, it’s about brushing aside the conclusions to which the evidence points in order to hope for new evidence that points away from God. This is the best appeal that Atheists have today. Understand that despite the hoopla and the intellectual façade, atheists have moved beyond evidence into the world of imagination. Their theories are out of evidence, unfortunately, their pens are not out of ink and they are destroying the faith of this generation. You, as a Christian, stand squarely on the mountain of evidence and have no need to move. Read on…. Celebrity Atheist and Theoretical Physicist, Lawrence Krauss says that the nothing from which the Universe came is not really nothing. Nothing does not really mean nothing. Celebrity Atheist Neil deGrasse Tyson and many others, say that there are an infinite number of universes and that the incredible precision of dozens of forces are a fortunate accident. Oh, and the multi-verse may have been created by superior alien beings. Celebrity Atheist Sam Harris argues that though everything exists as the result of some remarkable accident, there exists a set of objective moral standards to which everyone is obligated. Celebrity Atheist and New Testament Scholar Bart Ehrman himself in his book, “Misquoting Jesus,” admits, “the essential Christian beliefs are not affected by textual variants in the manuscript tradition of the New Testament.” Yet he argues that we cannot know that we have the inerrant word of God. It’s fair to have questions. The answers are available. 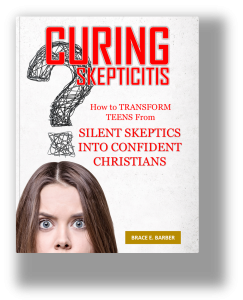 The first book will lay out the practical how-to steps for keeping Christian kids Christian for Churches and parents. The second book is a book covering 14 apologetic subjects with tools to make it as easy as possible for anyone to teach and learn.